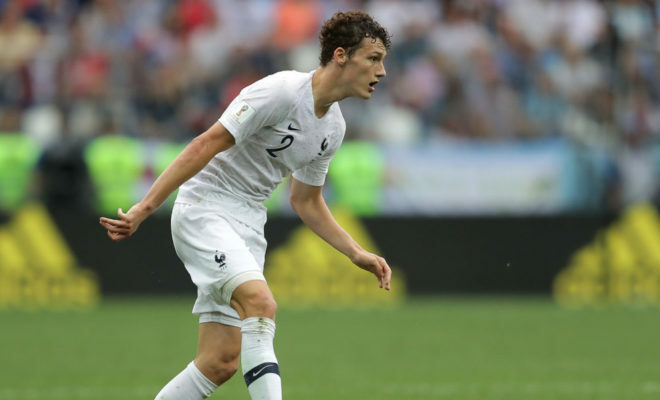 Liverpool have been given a transfer boost as key target Benjamin Pavard has denied claims that he has signed for Bayern Munich. The defender has seen his stock rise after an amazing world cup which saw him star in the right back position for World cup winners France. The Stuttgart player revealed to French tabloid L’Equippe that he is currently happy in Germany amidst interest from many top clubs in Europe. Pavard insinuated that news circulating about a deal with Bayern was rumour as he plan was to remain in Germany for this season. I did not sign anything at all. You are the journalists who say that I signed. I’m in Stuttgart, I’m fine there. My career plan was to stay one more season in Germany. I am in a very big German club, with fantastic fans. This club is a family, that’s what I need and that’s what I like about this club. I’m very good there. Several premier league clubs have been monitoring the defender with London clubs Arsenal and Tottenham reportedly interested in the player. Liverpool are also interested in the right-back as Klopp values his versatility as he can also double as a centre back. However, news reports from Germany have claimed that Bayern Munich are the favourites in signing the 23-year-old fullback. Pavard displayed a superb balance of attacking and the defensive masterclass in Russia culminating in being awarded the best Goal of the tournament for his wonder strike against Argentina in the round of 16. Its only a matter of time before he moves from Stuttgart despite the player claiming otherwise as there would be lots of offers for the defender if he continues his rich vein of form.